A group of Nine Inch Nails fans who call themselves a tiny little dot have spent the last three years sifting through fan-shot footage from the final show of Nine Inch Nail’s “Wave Goodbye Tour” at Los Angeles’ Wiltern on September 10th, 2009. Today, they’ve released the result of their efforts, in the form of a three-a-half hour, 37-song concert film entitled, nine inch nails: [after all is said and done]. According to a tiny little dot, the film is culled from over 75 hours of footage taken from “27 unique fan shot HD footage sources.” Over 3,500 hours was spent on per-production treatment, a team of nine editors and seven peer reviewers then spent over 680 hours editing each song, and audio from five sources was dubbed in over the course of 65 hours in a professional studio to create final stereo and 5.1 audio masters. The film is available to stream via YouTube below, download via torrent, and will be available soon on Blu-Ray/CD. What’s more, the audio itself is also available to download via torrent. The culmination of this work is a video production of a NIN concert unlike anything ever before – an evocative and unapologetic document of Nine Inch Nails. As an intimate concert performed before only a handful of fans, what the performance lacks in huge stage production value, it makes up for in vitriol, raw energy and cramped quarters… with sentiment, emotion and intimacy. But what really shines a light on the brilliance of the performance is the manner in which it was captured. The fan-shot footage of AAISAD conveys a raw, visceral and kinetic energy that no professional camera could have ever hoped to achieve. And in the context of a performance like this, one so intimate, one so meaningful to their fans, nothing else would be fitting. 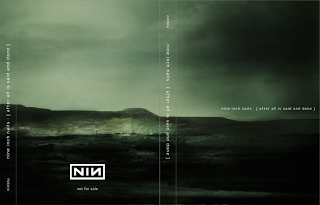 And it’s that which sets AAISAD apart as something uniquely memorable, and something that no NIN fan will want to be without. - Over 50 trips back and forth to production facilities using a 1.5 TB “delivery” drive to transfer treated footage to our RAID array.